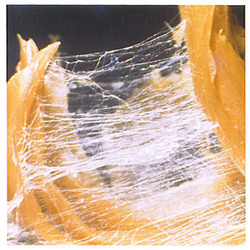 Fascia (click on the word "fascia" for more important information about it from John Barnes, P.T., L.M.T., N.C.T.M.B.) 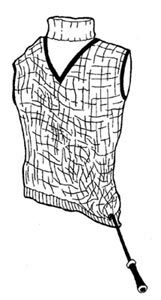 is a specialized system of the body that has an appearence similar to a spider's web or a sweater. Fascia is densely woven, covering that surrounds, supports, and connects every muscle, bone, nerve, artery and vein down to the cellular level, as well as, all of our internal organs including the heart, lungs, brain and spinal cord. It's composition is similar to connective tissue but with more collagen, making it very strong. It has the tensile strength of 2000 lbs per square inch. It is the strongest tissue in the body, even much stronger than our bones. This fascia extends completely from head to toe, without a break in between. With this whole connectedness, it is like the pulling and tugging of the yarn from a sweater when there is an imbalance of it. Fascia plays an important role in the support and function of our bodies, since it surrounds and attaches to all structures. The following is noted by John F. Barnes, P.T., L.M.T., N.C.T., M.B., "The fascial system functions as a fiber optic network that bathes each cell with information, energy, light, sound, nutrition, oxygen, biochemicals, hormones and flushes out the toxins. The brain and nerves are an important but a much slower form of communication. The ion-transfer mechanism of nerve impulses is slow to account for the massive amount of information necessary for our body/mind to function. Therefore, it is the fascia, your liquid crystalline matrix, that is the major and most important communication system of our body. The fascia functions as a fiber optic network connecting every aspect of our mind/body at an enormous speed." The fascia is our bodies inner fabric. It is the most important connective tissue we have because it's job is to support and provide flexibility, strength and stability to move us through space. In the normal healthy state, the fascia is relaxed and wavy in configuration. It can be stretched and moved without restriction. Every movement we make, every trauma we experience affects the fascia and causes it to re-structure itself in response. The fascia's job is to help us function at our optimum so it will toughen up around the places we have injured or used repeatedly. Scars are fascial restrictions. 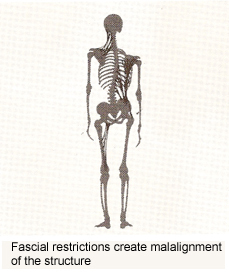 Long time poor posture creates fascial restrictions. Inflammation that is thwarted creates fascial restrictions. Chronic emotional stress creates fascial restrictions. While this "safety mechanism" helps our bodies locally and in the short term, unless we have taken the time to release these restrictions, they will begin pulling and tugging down on the remaining fascia fabric (such as described with the sweater picture and paragraph to the left). When there has been physical trauma, emotional trauma, scarring, or inflammation the fascia loses this pliability. It becomes tight, restricted, and tension to the rest of the body. Over time, this local toughening and hardening will make our bodies weaker setting us up for injury. The pulling of the fascial fabric sets us up for possible pain, headaches, restricted motion, and dysfunction down the road in areas that may not be local to the original trauma or restriction. Flexibility and stability can be compromised and also the ability to withstand stress and perform daily activities. What this means for you is that a program of sessions of Release the Pain in Sacramento and coupled with your own self care treatments at home, will allow your fascia to become more flexible and unrestricted. This provides your cells, organs, bones, muscles, nerves, and intracellular tissues to receive more of the proper nourishment that they require, because they are no longer bound, interrupted, and entangled in the fascia web, as before the session. They will function in a healthier way, the way they were meant to. The intracellular and nerve intra-communication will happen with improved speed. On a spiritual level, the ability to 'hear' and connect with your consciousness increases. You will notice more clarity, common sense, improved focus, and better peace of mind. 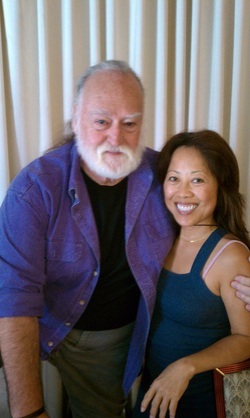 Click here for intriguing fascia videos of a live person!